With 2017 underway, maybe Santa Claus didn’t get you all the luxury gifts you wanted. If a luxury yacht didn’t fit under your Christmas Tree, don’t fret. You can buy the M/Y IMPULSE – Sunseeker 90 luxury yacht. The M/Y IMPULSE – Sunseeker 90 luxury yacht was built by Sunseeker International in 2007. Las year, M/Y IMPULSE finished a five month renovation. The interior of this luxury yacht got a brand new interior. In addition, the Sunseeker 90 superyacht got new sundeck furniture plus new water-sports equipment. 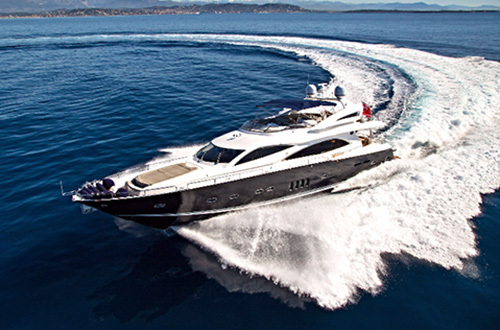 The M/Y IMPULSE – Sunseeker 90 can accommodate up to eight guests. This luxury yacht feature four cabins. There is a gorgeous full beam master suite, plus a spacious VIP suite. You will also find two twin cabins. All four cabins are equipped with flat screen, LCD televisions as well as full en suite facilities. The yacht handles beautifully and is powered by 1,800hp Caterpillar engines. As a result, the yacht can reach water speeds up to 30 knots. For improved handling, M/Y IMPULSE comes with zero speed stabilizers that provide anti-roll comfort both in port and at sea. Many people dream of owning a luxury yacht. Getting away from the stress in our daily lives is important. Maybe the time has come to consider looking into owning your own yacht, like the M/Y IMPULSE – Sunseeker 90. If you are interested, you’re in luck. This superyacht just got a large price adjustment of EUR 450,000. It can now be purchased for just EUR 1,850,000 – excluding VAT. The M/Y IMPULSE is 28m in length (91′ 10″) and a beam of 6.30m (20′ 8″). You will enjoy the VIP experience of having a crew of four at your disposal such as cleaning and cooking. For entertaining your guests, enjoy the large saloon equipped with a state of the art entertainment system. Sip on your favorite cocktails in the yacht’s own bar. To enjoy a romantic dinner for two, or a large social gathering, eat in the separate, formal dining area. Enjoy the sun and outdoors on the expansive flybridge deck. There is plenty of space to sunbathe and sit and watch the awesome views. Food and drinks are never too far away, The deck has a refrigerator, ice maker and grill. Time to take your next dream vacation on this luxury yacht – M/Y IMPULSE – Sunseeker 90. We can help you locate and purchase that luxury yacht you have always wanted. Consider the incredible, M/Y IMPULSE – Sunseeker 90 or many others we have access to. Return again to read our luxury blog for additional superyachts for sale.